DATA: I've been digging around online today to find if there's anything along I-90 between Seattle and New York City that might spruce up the drive. And, as usual, I'm finding a ton of other interesting information while I'm looking, but not finding the info I really need. (Like, say, I-90 is the longest interstate in America, or that Alaska as no interstates at all.) 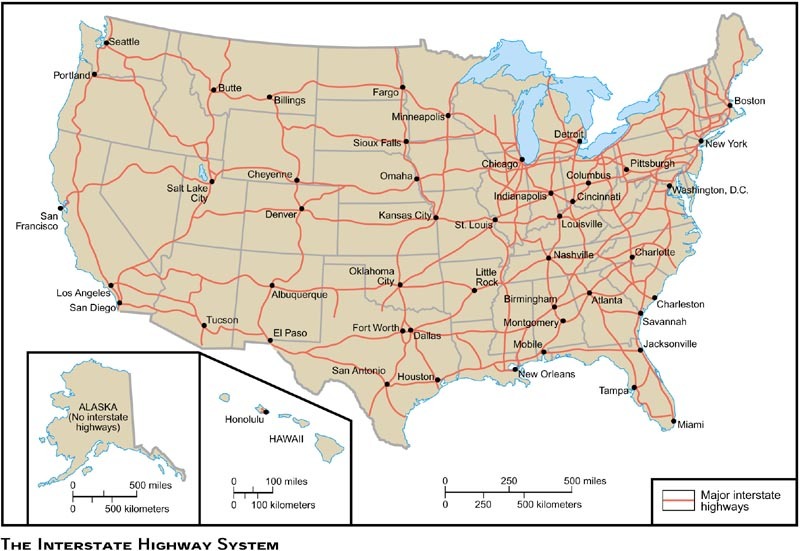 I never realized there were so many resources for information on the interstate system online. First a little background: The interstate system will mark it's 50th year in 2006. Why was it built? Well, it was sold to the public as a national security precaution: interstates could be used to evacuate large cities in case of an impending nuclear attack. Of course, we all realize now that that's a joke (you think traffic is bad now, try getting somewhere with the threat of impending doom creeping up behind you and every other road-rager on the street). * One or two digit even-numbered Interstates are always east-west routes. The numbers increase from the south (I-4) to the north (I-96). * One or two digit odd-numbered Interstates are always north-south routes. The numbers increase from the West Coast (I-5) to the East Coast (I-95). Anyway, for two nice (but poorley scanned) maps that show the major East/West and North/South routes in the States, check out Newbie Driver. The best resource for all sorts of random Interstate information has to be The Interstate Guide. Last, but not least, if you need a listing of the signs that exist at every I-90 exit in New York State, visit this d00d's website. I wish they had a website like this for the entire nation. I'm amazed. What an insane amount of pavement. Now if our government would just put a little more attention to faster, safer technology, like bullet trains, we'd be set for the next couple hundred years... until we get that global vacuum bullet train thingy worked out.